I have just arrived in Buenos Aires and have already managed to find a place to stay, drop off my laundry and eat lunch. A wholly productive day if I do say so myself. The sun is shining here and the temperature is about 25C, which is a nice change from yesterday and the last two weeks (but I will get to that in a moment). I will save my thoughts on B.A. until my next update (chapter 3, I suppose) seeing as I haven't yet seen much of it. But enough about the present, let us pick up where I last left off, in Bariloche, Argentina almost two weeks ago. I have already described Bariloche, and only really have one point to add - ARGENTINA MEAT IS GOOD! Argentina is known for its beef (though I suppose if you didn't know that then the last statement would be false, no?). I spent four days in Bariloche testing all sorts of cuts of meat including beef, lamb and pork. And due to their economic woes, it is cheap too. The best meal I had in Bariloche was at a small parrilla (steak house) off the main street. I had a 1/2 bottle of wine, a sausage appetizer, a 10 oz filet (that was the small one!) and a side salad. Total of the bill was 34 Argentina pesos, which comes out to about 16 dollars Canadian. The saddest part about leaving Bariloche was knowing that it would be a week and a half until I would eat in Argentina again. From Bariloche I took the bus across the Andes to Puerto Montt. The bus ride across the Andes was spectacular, though not as impressive as the boat ride over (see the first update for details). Puerto Montt, Chile is a smallish town situated on the Chilean coast. It is a weird mix of cultures, being part naval base, part cargo port, part cruise ship destination and part fishing village. The most interesting thing in Pto. Montt was the fish market at the end of a pier. There were about 100 stalls each selling the catch of the day. In fact, many of them have small kitchens and a few tables were they will prepare a meal for you right there. However, this is not for the weak of stomach. 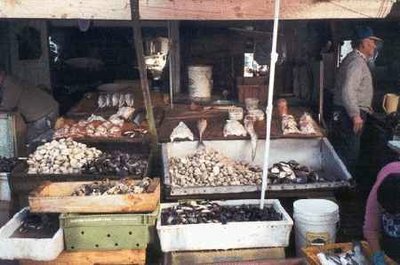 The fish are removed from the boats and placed on watered boards to await sale. Every so often the fish are sprayed down to remain cool. There are no fridges, freezers or even ice on which the fish is kept cool – just the occasional spray from the hose. I must admit that other than a few seafood meals, I had a very American existence in Pto. Montt. As Pto. Montt has a mall with a food court selling KFC and McDonalds and Superbowl was on that Sunday, I decided to live American for the weekend, eating fried chicken and watching American football, though for a touch of local colour I did have to listen to the game in Spanish. Monday, January 27th I boarded the Navimag ferry for a 4 day trip along the coast islands of Chile to Puerto Natales in Patagonia. The coast of Chile can best be compared to the Pacific Northwest (British Columbia, Oregon, Washington). Lots of mountainous islands covered with evergreens and waterfalls. We sailed for 4 days through the fjords and channels, only spending 8 hours in the open ocean. Though I didn't see killer whales or dolphins (both which occasionally make appearances along side the boat), I did see a number of sea lions both sunning themselves on rocks (when the sun made a rare appearance) or splashing through the ocean. The Navimag ferry is also called the "gringo boat," due to the large number of backpackers which take the ferry down to Pto. Natales and on to hiking adventures in Torres Del Paine national park (more on that later). I must admit I met some very interesting people on the boat. Most people had been or were planning on backpacking for multiple months. I met one woman from Detroit who had just quit her job as an engineer at Ford and was spending a year hitting 5 of the 7 continents. I also met a couple that had driven their Range Rover from Alaska all the way down to Chile and were planning on going all the way to the tip of South America. Oh, and they had brought their two and a half year old daughter along for the journey. Listening to stories like these made my seven and a half week journey seem like a picnic in the park! After 4 days we arrive in Pto. Natales, which is an unremarkable town. Its only function seems to be as a starting point for trekking expeditions into Torres Del Paine national park. Torres Del Paine is a large national park in Chilean Patagonia comprised of flat plain and towering mountains, including the famous "towers," three near straight up rock formations climbing from near sea level to a mile high. 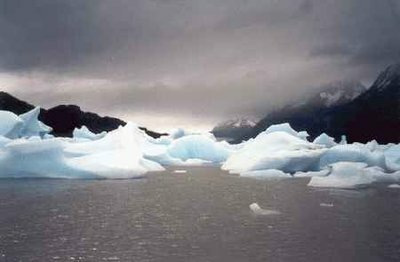 In addition it is home to a number of glaciers, which are constantly cracking small icebergs off to float in the numerous lakes in the park. Torres Del Paine is a fascinating place and encapsulates Patagonia to a tee - wind swept plains where no tree can grow more than a few feet high lest it be blown over by the wind. Soaring, snow capped mountains buffeted constantly by rain and wind. And cold. Overall, my impression was that it looked a lot like Montana, though I have never been to Montana and am basing this solely on things I have seen on TV about Montana. For those of you who I talked to previously about my trip, you may have heard me mention a 5 day hike I was planning on taking. Torres Del Paine was to be that hike. However, once arriving in Patagonia I had a serious change of heart. I was prepared for a little cold weather down in Patagonia, but the weather presented to me was nothing that I expected at all. The temperature could be mild enough, rising to 15C during the day when the sun was out. But that was infrequent at best. Usually the sun was covered by black clouds spewing rain. And the wind was hellish, coming off the ocean and across the plain like a freight train. You couldn't even talk at times to the person next to you over the whistle of the wind. All this combined to make it feel close to freezing most of the time. Seeing the breath escape my mouth was a common occurrence. My fleece jacket and wind breaker were no match of the Patagonia weather, and I had to abandon the planned hike. In fact, so wet and cold and miserable was I that I made it my mission to see how quickly I could arrange to get my shivering buttocks to Buenos Aires and the sun again. My last act prior to leaving Patagonia behind me was to see some Penguins up close. I took a half day trip to a Penguin reserve. Fascinating creatures, and I could have spent more time watching them for sure. The first 45 minutes was spent watching them waddle around the beach and up along well worn paths into the grass lands. About that time I spotted a family unit, two parents and two kids. Watching them interact with each other and the other penguins was amazing. The parents are very protective of the young ones, often raising their heads and making a loud "wun-wun-wun" cry. While doing this, their small wings flap wildly at their sides, and their chests heave with the effort of such a small bird making such a big noise. And most amazing was seeing the penguin nests, which are burrows underground. Exact how a bird with short, stubby flippers digs a 3 foot deep hole in the ground is beyond me, but somehow they manage it. And after a bus trip to Punta Arenas, Chile, another bus across the border to Rio Gallegos, Argentina (both towns not worth mentioning in a travelogue except to say that a fellow traveller I met from Hamilton compared Punta Arenas to Sudbury on a bad day, which was a very fitting description), I caught a morning flight to Buenos Aires. And that brings us to the present. I am healthy other than a stomach virus I have been fighting for a week now. However, I think I have it on the run (or rather, the runs it was producing in me are fading - hahaha). Tomorrow I plan to do a tour of B.A., including Eva "Evita" Peron's grave and the place from which she (and Madonna) implored Argentina not to cry for her. As well, I will be planning my next moves - most likely a flight to La Paz, Bolivia and then buses to Isla Del Sol (the birth place of the Incas) and the ruins at Machu Pichu, Peru. So while this missive has been filled with the geographical and natural wonders of Patagonia, expect the next one to be focused on historical and archeological features.